Valborgsmässoafton is celebrated in Sweden on April 30th, but we gather to greet spring on the first Saturday of May, when Hager Park opens for the season. Please make plans for your family and friends to join us for this fun-filled event. Hager Park is a beautiful park with walking trails through the woods a large wooden castle, swings and more in the play areas for children. After supper you may chose to go on a tipspromenad (quiz walk), which is a stroll through the trails of the wooded park to locate signs with trivia questions about Sweden. Feel free to bring your walking stick! There will be a version for children and one for adults. Whoever answers the most questions correctly will come away with a prize! Music will be part of the festivities and our own SAHS Chorus will sing by the bonfire at the end of the evening while guests toast marshmallows for their s’mores. Food and drink will be served. The menu consists of grilled hot dogs or brats with chips, munchies and soft drinks, coffee or water (alcohol is prohibited on park property). Please bring a dish to pass. A-L desserts and M-Z salads/side dishes. Cost is only $5 for 15 years and up; $2 for ages 5-15; under age 5, free. Easy directions: Take I-96 west towards Holland. Take the Chicago Drive exit (69B). Turn right on Main Street to Baldwin, then take a left. Turn right on 28th Avenue and the park is within half a mile. Follow the signs to the SAHS picnic. Please register by May 1 so we know how much food is needed! You can either register online, or by mailing a check to SAHS/WM, 29 Pearl Street NW, Suite 127, Grand Rapids, MI 49503. Make checks payable to SAHS/WM. 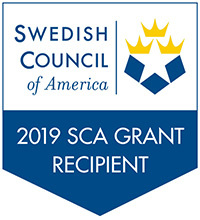 We are happy to announce that SAHS/WM has received a grant from the Swedish Council of America to sponsor a series of three events built around Swedish Cuisine: “Scandinavian Cuisine Throughout the Year.” Our first class will be a cooking demonstration on food for summer. With midsommar just around the corner in June, the Ginger Chef (Jennifer Zirkle-Grawburg) will give us some ideas for Swedish recipes for picnics, and other outdoor celebrations. The cost is $10 and reservations are required, as there is limited seating due to the nature of the class. Reservations are due by May 13. Limited to the first 40 who register, so sign up early! You can either register online, or by mailing a check to SAHS/WM, 29 Pearl Street NW, Suite 127, Grand Rapids, MI 49503. Make checks payable to SAHS/WM. Broken Wheel, Iowa, has never seen anyone like Sara, who traveled all the way from Sweden just to meet her book-loving pen pal. When she arrives, however, she finds Amy’s funeral guests just leaving. 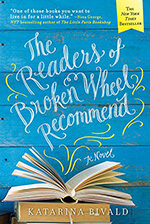 The residents of Broken Wheel are happy to look after their bewildered visitor—not much else to do in a small town that’s almost beyond repair. They just never imagined that she’d start a bookstore. Or that books could bring them together—and change everything. We will be meeting at Covenant Village of the Great Lakes, 2510 Lake Michigan Drive NW (between Oakleigh and Fairfield). The book is available at Schuler’s, 2660 28th Street SE. You can also buy the book online at Schuler’s or another independent bookstore.